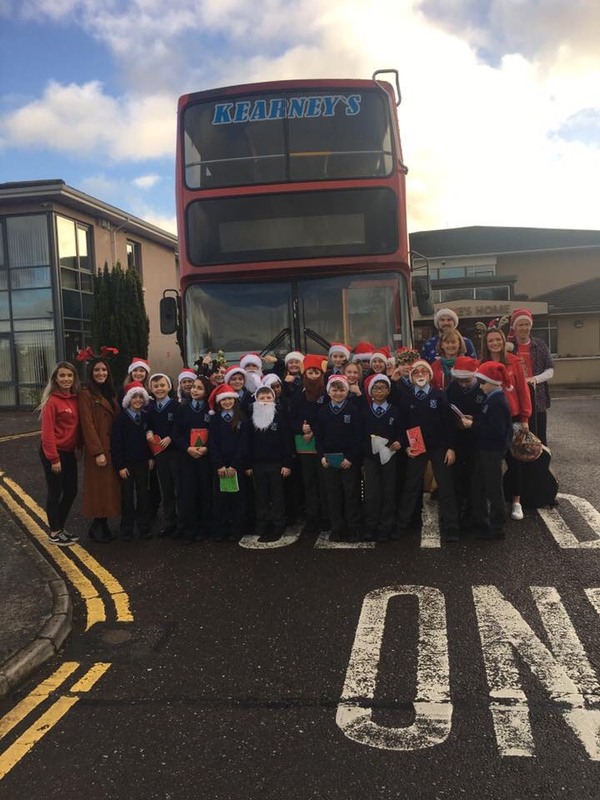 The boys and girls from Mr Brosnan’s 5th class visited nursing homes last Wednesday as part of Mrs Kelly’s annual Christmas Cart Initiative with Red FM. The Red Patrollers came to say hello to Mr Brosnan’s and Mrs Kelly’s classes before escorting the children to the Red FM bus. Rang 5 were waved off by the two 2nd classes, the 5th classes, their teachers, Mrs Horgan and Mr O’ Brien. They visited the residents of Glyntown Care Home, Powdermills in Ballincollig and St Luke’s in Mahon. They met many lovely ladies and gentlemen in the nursing homes and even taught the nurses how to do the floss! A lovely lady called Patsy was so happy to see them that she gave them homework off. A huge thank you to Mr Barry’s class, Mr O’ Driscoll’s class, Ms Collins’ class, Mr Brosnan’s class and Mrs Kelly’ class 2nd class for making beautiful cards for the elderly. We would also like to thank Ms Mahony’s Sr infants and Ms Stoke’s 3rd class for making some extra cards in case we were short! Each and every card and gift was greatly appreciated and a great day was had by all!